BMW have been proving for some time now that large estate cars can be both practical and desirable and the new BMW 5 Series Touring Estate is a case in point. It’s comfortable, stuffed with lots of advanced technology and it’s a great motorway cruiser. 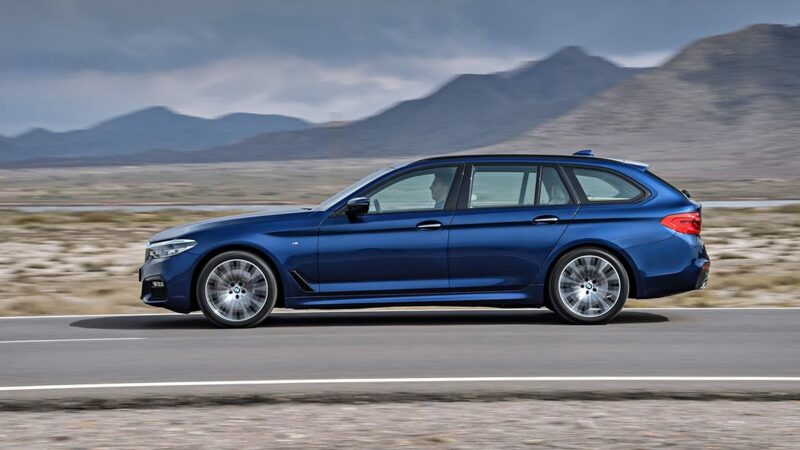 If you’re the kind of buyer who wants something more from an estate than just a large boot that can swallow your luggage whole, the 5 Series Touring has got the style, the equipment and low running costs too. Factor in the badge appeal and its reputation as “the ultimate driving machine” and it represents a highly accomplished choice. OSV takes a closer look at what this executive estate is all about with our BMW 5 Series Touring review. 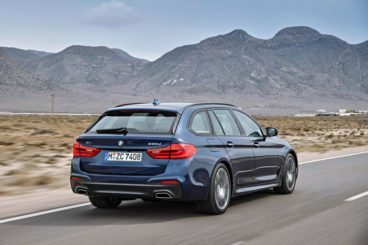 How does the BMW 5 Series Touring Estate perform? Although the Touring model is a bigger and weightier affair than the 5 Series Saloon, it’s still just as good to drive and sets a benchmark for all cars in this sector to aspire to. We do have a criticism, though: You don’t get adaptive dampers as standard, and unless you add them as an optional extra, your ride enjoyment just won’t be as good as it could/should be. There are also adjustable dampers available that enhance the handling even more, but even without them, refinement is excellent, while the smooth as Tennessee whiskey’s 8-speed automatic box is a dream. Make no mistake, it’s still a good car to drive in skeletal form without any additions, though to really enjoy the very best handling, you will need to part with a bit more of your hard-earned cash. All engines are strong, with even the base-level units offering solid performance. In terms of engines, there are plenty of engines available that tailor to different tastes. An entry-level variant is a 2.0-litre unit that isn’t at all punchy but is capable of returning 60.1mpg while emitting just 122g/km of CO2. Our pick of the diesels is a six-pot 3.0-litre power plant that powers the 535d model and can power you and your shopping from rest to 62mph in just 5.4 seconds. Although most of the sales will be diesels, there is also a wide range of petrol units available, with the entry-level 528i 242bhp kicking things off. The 3.0-litre 302bhp engine will prove to be a popular choice with buyers; turbocharged, it can get you from standstill to 62mph in 5.8 seconds. We recommend that you don’t get stuck with low revs in a high gear, as the engine isn’t as responsive as you’d desire. The Touring takes the best of the Saloon’s interior and builds on it. The cabin is minimalist and pleasing on the eye, and it reeks of top build quality, with high-class materials noticeable throughout. 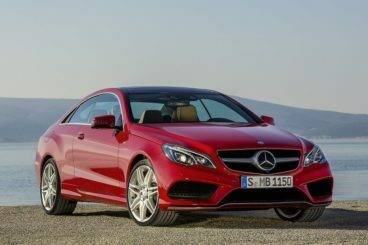 It’s good enough to rival the Mercedes and Audi offerings in this class and the layout is overall logical, user-friendly, and focused on the driver. The iDrive infotainment system is a real catch and is arguably the best tech of its kind in this sector. Legroom is good for two adults in the back, though a central passenger might quickly feel uncomfortable thanks to a large central tunnel that forces folk to sit with their legs apart. Access is good, however, thanks to large doors that open wide. The driver seat is now adjustable which means it’s easy to get comfortable (driver comfort was an issue last time around), but you will need to exert some manual power to move the seat back and forth for extra comfort. Space up front is great and there are plenty of cubbyholes dotted around the place so that things don’t get too messy. But what about the all-important boot? The boot here measures 560-litres, which is really impressive. If you fold the rear seats down, you can extend its size to 1,670-litres. It’s large and extremely practical, coming as it does with the widest boot floor in this class, as well as a shallow underfloor storage area and load-restraining nets. All models are generously equipped, with even the entry-level trim coming with the important features that justify its price including Bluetooth connectivity, leather seats, cruise control, climate control, parking sensors and an electronic handbrake. Opt for the range-topping M Sport variant and you’ll also get 18” alloys, an M Sport body-kit, M Sport suspension and an M Sport steering wheel. There are a wealth of optional extras available and they could easily see your purchase price rocket. Some of the more interesting options include Surround View and Park Assist, a system that steers the car into a space for you. Prices start out from £33,300 and rise to £51,000. If you want to lease the car over three years, either as a company or an individual buyer, you’d be looking at paying something between £200 and £313+VAT. BMW have worked hard to lower running costs this time around and have used a range of measures to keep the numbers down. Such measures include aerodynamic efficiency and active radiator grilles. The entry level 518d returns 60.1mpg and emits 122g/km of CO2 thus appealing to companies looking for a fairly inexpensive fleet. The 520d unit fares slightly better, using a modified variant of the same power plant, it’s good for 61.4mpg and emits the same CO2. If you’ve got your heart set on something racier, the 535d unit can return 49.6mpg while emitting 149g/km of CO2 and gets from rest to 62mph in 5.4 seconds. The 5 Series Touring does well to hold onto close to half of its initial value after 3 years. The entry-level car sits in group 41 for insurance, while the top of the range model sits in group 46. If you doubted that BMW could possibly transfer the drivability of the saloon to the estate, you should probably take a long look at yourself in the mirror. Handling is BMW’s strength and unlike many other brands, they see no reason why an estate has to sacrifice behind-the-wheel enjoyment, for comfort when you can have both. It’s really on the motorway that the 5 Series Touring comes into its own and immerses you in the experience. Long distances have never been this much fun and stress-free in such a big executive car and with so many optional goodies on offer, it’s impossible not to enjoy driving this vehicle. These types of cars live and die by the size of their boot. The BMW’s is sized at 560-litres, which makes it one of the biggest in its class. But the German brand know that size isn’t the only thing that matters to buyers and as such, they’ve added plenty of neat practical touches that make this one of the cleverest and useful boots around. Moreover, BMW has been able to extend the size of their boot this time around by redesigning the rear seats so that you can now easily load bulkier, bigger items without a problem. The wheelbase is considerably lengthy and this has increased interior space. Legroom is good up front and in the back, as is headroom and shoulder room. This might be an estate, but it’s a premium executive estate and you’d be forgiven for expecting a little bit more smoothness from the exterior styling. The styling caused a lot of controversies when the car was first launched and unfortunately, things might be a bit too dour for many peoples’ tastes. The sharp front styling is different, to say the least, but BMW’s attempts at experimentation have completely missed the mark, which is something of a shame. Although this car can drive like a dream, the key word here is “can.” To draw the very best out of its exceptional potential, you will need to add in a few optional extras such as adaptive dampers that could see the overall price shoot up. If your mind is not yet made up, you might want to see what else is on offer. In the comparison section of our BMW 5 Series Touring Estate review, we take a look at what its closest rivals have got to offer. The first thing that you might notice about the Mercedes-Benz E-Class Estate is how easier on the eye it is compared to the BMW. While BMW has gone for a strangely unorthodox aesthetic that simply doesn’t work, Mercedes have stuck to what they do best, which is crafting elegant, austere machines that command respect on the road. Whereas BMW like to refer to their vehicle as a Touring, Mercedes prefer to call a spade a spade. This is a premium estate, and it does everything you want such a car to do. Its 695-litre boot is well over 10-litres bigger than the one in the BMW and it can carry huge loads on long journeys without any hassle at all. Indeed, although the Mercedes can’t rival the BMW for out-and-out handling, it’s comfortable enough and thanks to the sportier suspension it’s even a little bit fun. If you can afford the Sport model, you’ll also benefit from an enhanced suspension setup that improves body control and offers more grip in corners. Both cars have done well to keep running costs down this time around. The cheapest unit to run in the BMW range is good for 61.4mpg, while the most frugal in the Mercedes-Benz E-Class Estate line-up is an E300 BlueTEC Hybrid that can return 64.2mpg on a good day. If the Mercedes has a hole in its raft, it’s the four-pot diesel unit which is unnecessarily noisy. This is a shame because the petrol line-up is mostly lacklustre, while the rest of the diesels are nowhere near as cheap to run as the main offender which emits a grating throaty rasp of the kind you don’t usually associate with a Mercedes. 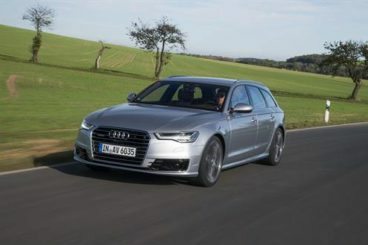 The new Audi A6 Avant is one of the best executive estates on the road at the minute and manages to boast low running costs despite the amount of luxury on offer. Audis are not generally known for their comfort, but the 2016 A6 Avant benefits from light suspension and steering that makes it a fair old comfortable cruiser. The Quattro four-wheel-drive system can be fitted to most models and this allows for more grip without weakening the driving experience. The Ultra Diesel is an entry level engine but despite this, it’s got plenty of pace and can get you from a rest to 62mph in 8.1 seconds. A 3.0-litre diesel engine is easily the top performer and suits the car’s executive character better. There are no petrol engines available but a range-topping, bi-turbo diesel is ideal for enthusiasts and can gun you from a standstill to 62mph in just 5.0 seconds, before maxing out at 155mph. Due to there being no petrol engines to choose from, running costs are generally very good across the range. The 2.0-litre Ultra diesel is not too expensive to buy outright and can achieve fuel economy returns of 67.3mpg while costing just £20 a year to tax. However, to get those figures you need to be careful about what you specify. For example, opting for larger wheels will bump up the costs. The Audi A6 Avant’s interior is a real strong point. Both the driver’s seat and steering wheel are fully adjustable, while standard front and rear parking sensors make it relatively easy to park this large saloon. The cabin is well-built and features lots of soft-touch plastics, while overall fit and finish are better than many of its rivals. The controls are all easy to find and operate and the car gets the brand’s intuitive MMI control system, which has been improved. Practicality is good. The 530-litre boot beats the one in the BMW and it can be increased to 995-litres if you fold down the rear seats. 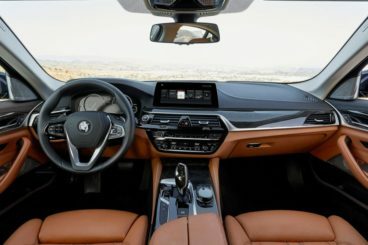 There is a lot of space in the back even for taller passengers, while large windows give the cabin an airier feel than the 5 Series. Without a doubt, this car is a class act. It might not be able to boast a boot of epic proportions quite like the E-Class Estate and it might not even be as practical, or as good to look at as some of its rivals. However, its driving experience is unequalled, badge appeal undeniable and its comfort and interior is of bank-vault quality. As ever, the BMW 5 Series Touring Estate is a seriously attractive proposition.